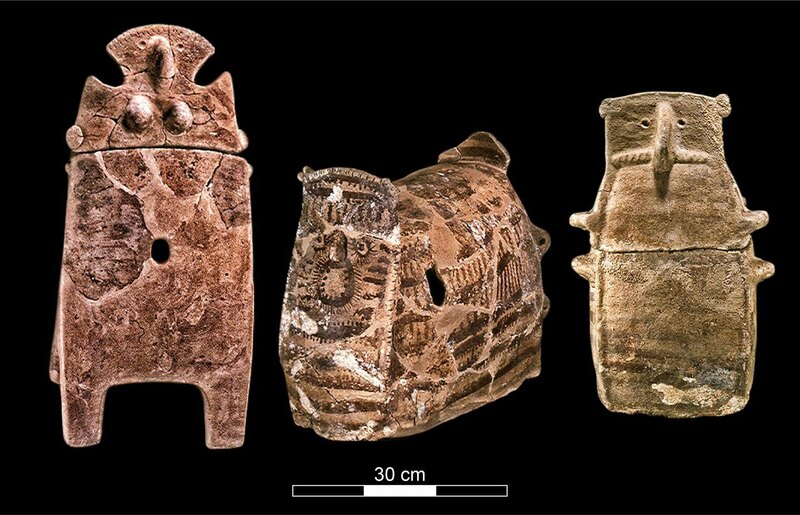 Above image: These ossuaries — containers for human remains — from the Chalcolithic Period were excavated at Peqi’in Cave in northern Israel. Thousands of years ago in what is now northern Israel, waves of migrating people from the north and east — present-day Iran and Turkey — arrived in the region. And this influx of newcomers had a profound effect, transforming the emerging culture. What’s more, these immigrants not only brought new cultural practices; they also introduced new genes — such as the mutation that produces blue eyes — that were previously unknown in that geographic area, according to a new study. Archaeologists recently discovered this historic population shift by analyzing DNA from skeletons preserved in an Israeli cave. The site, in the north of the tiny country, contains dozens of burials and more than 600 bodies dating to approximately 6,500 years ago, the scientists reported. DNA analysis showed that skeletons preserved in the cave were genetically distinct from people who historically lived in that region. And some of the genetic differences matched those of people who lived in neighboring Anatolia and the Zagros Mountains, which are now part of Turkey and Iran, the study found. Ancient Israel (then called Galilee) belonged to a region known as the southern Levant, part of a larger area, the Levant, which encompasses today’s eastern Mediterranean countries. The southern Levant experienced a significant cultural shift during the Late Chalcolithic period, around 4500 B.C.E. to 3800 B.C.E, with denser settlements, more rituals performed in public and a growing use of ossuaries in funerary preparations, the researchers reported. Though some experts had previously proposed that cultural transformation was driven by people who were native to the southern Levant, the authors of the new study suspected that waves of human migration explained the changes. To find answers, the scientists turned to a burial site in Israel’s Peqi’in Cave, in what would have been Upper Galilee 6,500 years ago. Peqi’in is a natural cave, measuring around 56 feet (17 meters) long and about 16 to 26 feet (5 to 8 m) wide. Inside the cave are decorated jars and burial offerings — along with hundreds of skeletons — suggesting that the location served as a type of mortuary for Chalcolithic people who lived nearby. However, not all of the cave’s contents appeared to have local origins, study co-author Dina Shalem, an archaeologist with the Institute for Galilean Archaeology at Kinneret College in Israel, said in a statement. “Some of the findings in the cave are typical to the region, but others suggest cultural exchange with remote regions,” Shalem said. The artistic styles of these artifacts bear closer resemblance to styles common to more-northern regions of the Near East, lead study author Eadaoin Harney, a doctoral candidate in the Department of Organismic and Evolutionary Biology at Harvard University, told Live Science in an email. The scientists sampled DNA from bone powder from 48 skeletal remains and were able to reconstruct genomes for 22 individuals found in the cave. That makes this one of the largest genetic studies of ancient DNA in the Near East, the researchers reported. The scientists found that these individuals shared genetic features with people from the north, and those similar genes were absent in farmers who lived in the southern Levant earlier. For example, the allele (one of two or more alternative forms of a gene) that is responsible for blue eyes was associated with 49 percent of the sampled remains, suggesting that blue eyes had become common in people living in Upper Galilee. Another allele hinted that fair skin may have been widespread in the local population as well, the study authors wrote. “Both eye and skin color are traits that are controlled by complex interactions between multiple alleles, many — but not all — of which have been identified,” Harney explained. “The two alleles that we highlight in our study are known to be strongly associated with light eye and skin color, respectively, and are often used to make predictions about the appearance of various human populations in ancient DNA studies,” she said. The scientists also discovered that genetic diversity increased within groups over time, while genetic differences between groups decreased; this is a pattern that typically emerges in populations after a period of human migration, according to the researchers. By presenting DNA from the distant past, these findings offer exciting new insights into the dynamic ancient world and the diverse human populations that inhabited it, said Daniel Master, a professor of archaeology at Wheaton College in Illinois. “One of the key questions of the Chalcolithic has always been to what extent the groups in Galilee were connected to the groups in the Be’ersheva Valley or the Jordan Valley or the Golan Heights,” Master, who was not involved in the study, told Live Science in an email. “The publication of the artifacts from Peqi’in has shown many cultural links between these regions, but it will be interesting to see, in the future, whether those links are genetic as well,” Master said. The researchers’ results also resolve a long-standing debate about the pivotal factor that changed the trajectory of the Chalcolithic peoples’ unique culture, Shalem said in the statement. “We now know that the answer is migration,” she said. The findings were published online Aug. 20 in the journal Nature Communications.